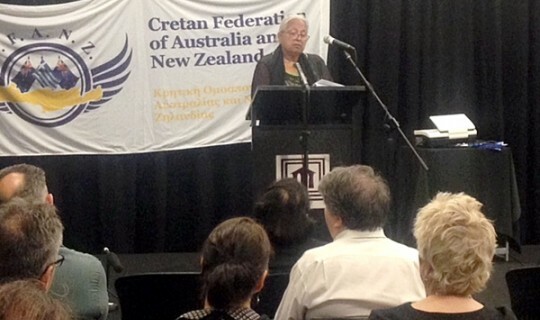 On the occasion of the 75th Anniversary of the Battle of Crete and Greece, the Cretan Federation of Australia and New Zealand presented an evening with Glenda Humes - the daughter of Captain Reg Saunders. Reg Saunders was the first Aboriginal Australian to be commissioned as an officer in The Australian Army. Reg fought in the Battle of Crete and spent nearly a year on the island. The event took place at the Greek Centre of the Greek Community of Melbourne (GCM). The speaker was welcomed by Mr Theo Markos, GCM’s Vice President, who said between others that she was the second Aboriginal speaker at the Greek Centre after Professor Gary Folley who launched the Greek History and Culture Seminars last year.